I think Reagan slept well last night. She woke up around 7:30am and was all smiles (her brother was up much earlier than that). She's been a good girl today. She had lots of therapy...OT, school, & PT and she did great for them all. Her PT put her in her new AFOs and so far so good. Size wise, they're not much larger than her last pair...just a little wider. After an hour (of just wearing them, not standing), she was red on the backs of her heels and the top of her foot (where the strap is). They didn't seem to bother her though. We had to skip the stander because her Hatchbacks (shoes made specifically for AFOs) are too small for her new AFOs. I guess it's time for a new pair!! She's been vocal off and on today...sometimes they are happy sounds and sometimes I'm not so sure. She hasn't wanted to wear her glasses at all today. I put them on, she takes them off. She also managed to take a little bite out of her arm today! The nurse had her on her tummy and I went over to talk to her and saw the nip! This is the same thing she usually does to our shoulders/arms...we call it a love bite but it's more of a pinch! I know from experience, it can hurt like heck, but she didn't seem bothered by it (although did swell up a little afterward). Crazy girl! Tonight she was so sweet and so tired. Hopefully she gets another good night's sleep tonight (our night nurse is working her only night this week tonight, so she'll be waiting for her if she wakes up)! Funny! My husband's comment on yesterday's post cracks me up! Maybe I am a little needy. I guess after days of no comments, you begin to think...am I just talking to myself?!?! The funny thing is, I read probably 50-60 different blogs and rarely do I have the time to comment on them (but they are always in my thoughts and prayers)! Now, on to business. Reagan slept well last night...really well. So well that I was afraid this might be a sleepy day and her photoshoot was going to have to be rescheduled again! She finally woke up though right before noon (with smiles), just in time for a quick visit from her speech therapist before we had to leave to go get her new AFOs. We were supposed to get these AFOs weeks ago and had to reschedule two times already, so I'm glad we finally got them today on our third attempt! It's been quite a while since Reagan has been in her stander because her old AFOs were giving her trouble! Hopefully these are much better and we can get her standing once again. This afternoon we were stressing to get everything ready for her photoshoot (including hauling an antique cast iron bed out to a field of flowers). It all worked out and we braved the gnats and spiders and I think the photographer got some really beautiful shots! I can't wait to see the final pics! Hello?? Is anyone out there?!?! I haven't had many comments lately...it makes me wonder where everyone has gone! I know it's summer, but come on! No comments on two days of pictures is very uncommon! Hopefully all is still good with everyone! We're still hanging in here. Reagan slept off and on last night. Mike had to go lay down with her for a bit and she got a little fussy at one point, but she did eventually go back to sleep. She still had some crazy laughs this morning but was a lot more serious tonight. Another big dirty diaper again today...what is that all about?!?! Still a little gaggy/spitty at times and definitely cold clammy hands and feet (and a hot torso)...but she's hanging in there. I'm hoping she'll be good for her rescheduled photoshoot tomorrow (we've got an appt to go get her AFOs beforehand so I'm hoping that doesn't piss her off). We've got a lot of variables that have to come together for this photoshoot to be a success (a happy, cooperative Reagan, good head control, hands out of her hair and mouth, a cooperative brother, good weather, good location, etc...)... so please keep it in your prayers that everything goes smoothly and we get some beautiful pics of my beautiful girl. Reagan slept off and on last night in the arms of the night nurse (from 12-4 & 5-7). She was very nauseous but she made it through the night without any more throw ups. We were discouraged to see her still struggling this morning, but we decided to go ahead and proceed with our plans anyway. She started to perk up a little (after another throw up), so we got everyone together and headed to Galveston! We went to the Aquarium Pyramid at Moody Gardens. Ryan made the whole ride asleep and Reagan was super spitty, but OK. It was quite hot and sunny but the Aquarium is all indoors and cool, so that was nice (we passed on the Rainforest Pyramid after reading reviews about the heat and humidity). This wasn't my favorite Aquarium for Reagan, but it still had some neat things. Reagan wasn't super alert today though, so I'm not sure how much she really enjoyed it. Ryan was interested in everything...watching the people, watching the fish, I think he wore himself out. Lots of people (we were hoping it wouldn't be as bad on a weekday)...we may have to go back when school is in session and it's less crowded. We made it through the entire aquarium and were in the gift shop when Reagan started laughing and we heard what sounded like a poop. I took her to the bathroom and pulled her out of the stroller only to see that it was EVERYWHERE. It was the biggest blowout I had ever seen. We had to take her back to the car and completely strip her down and wipe her from head to toe! What a mess (hopefully we can salvage that outfit). Since we were already at our cars, we decided to load everyone back up and head to the strand for lunch. We had a nice Mediterranean lunch and then stopped at the Candy Factory for dessert!! We made it back home without any more blowouts or meltdowns...so all is well. Reagan has had the crazy laughs off and on ever since her blowout today. She was still spitty and a little gunky in her throat, but overall she seemed to be feeling better. My dad and step mother even took her (and her brother) swimming tonight (I'll post those pics tomorrow)! All was good and then tonight the nausea returned full force and she was gagging and retching until she finally dozed off (and then had another two big throw ups). Ugh. Can't my girl catch a break?!?! Please keep her in your prayers! Reagan slept OK last night. She slept from about midnight til 5am. The night nurse picked her up and held her...but she never went back to sleep (and no smiles). She was very serious today but not as sensitive or fussy (but I did see some hints of a smile tonight). Her speech therapist and PT came and worked with her and both commented on how good her head control was today. She did have a big throw up this morning and one again tonight. She was a little more nauseous tonight and really fighting sleep. Please say some prayers for our girl. We have big plans for tomorrow and I'm not sure what we'll do if she doesn't make a drastic turnaround by morning!! She desperately needs some sleep to recover and get back to her happy self!! Reagan slept well last night (as far as I know). When we went in to check on her this morning, she was laying in bed wide awake and very quiet and still. She was fine until I started changing her diaper. She didn't want to be messed with...that attitude continued throughout the day. She was quiet and fairly content to just lay next to the television squirming around and watching cartoons. She did have several crying outbursts, but they were relatively short-lived. This afternoon I laid her brother down beside her to see what she would do and she immediately swatted him in the face!! I grabbed her hand and let them lay beside each other for a few minutes (all the while she had this "I'm not amused look on her face") and literally the second I let go of her hand, she swatted him in the face again! OK...point taken. Not good for Ryan, but definitely good to see her do something intentional! Tonight my Dad and step mother came in to stay with us for a few days. We're hoping to do something fun with them on Friday so I'm just hoping and praying Reagan cheers up by then! Please continue to keep her in your prayers!! Reagan slept well last night and then kept sleeping this morning. She woke around 10:30am (from us making noise) and she was NOT happy. It was immediately clear, this was not going to be a good day! Her eyes were very sleepy and she got the big frowny lip...then next thing we knew, it was full blown crying! This continued anywhere for about an hour...it seemed like eternity (despite a dose of Lortab). Finally she settled down and fell back to sleep. Ever since then, she's been asleep. She's restless though and every now and then she'll wake up a little and kick and squirm and let out a big yell or cry, but then she falls back to sleep. She was supposed to go get her new AFOs today (rescheduled from last week), but I had to cancel that and all of her therapies. We've really just been holding our breath hoping that she'll continue to sleep. She obviously needs it and being awake is not a pleasant experience for her right now. Poor girl. She had a little bit of awake time tonight that didn't involve crying, but it's still not looking good. Hopefully she sleeps it off tonight and wakes up tomorrow feeling much better (no night nurse til tomorrow). We have big plans for the end of this week, so I'm really hoping she'll turn a corner and be back to our happy healthy girl by Friday!! (If she's not better by tomorrow, we'll be heading back in to see the pediatrician!) Please keep her in your prayers!! The crazy laughs continue! Reagan was up most of last night laughing and then fussing & on edge. Daddy got up and tried laying down with her, but there was just no getting her back to sleep (even Lortab didn't seem to help)! Her mood today has been good...despite the lack of sleep. She's still laughing and smiling a lot. I fed her some blueberries/oats this morning and she did fine with it (but didn't seem to like the lumpy texture) and then about 10 min later, it all came back up! Not sure if her tummy was a little uneasy, or if it was just the texture thing bothering her. She seemed fine afterward. No more fever. She's still slightly congested in her nose...when she sleeps, she's definitely snoring! We had to cancel her photoshoot for today. The weather just wasn't cooperating (it's been a rainforest lately in Houston). The forecast said rain/thunderstorms but it was bright sunshine this morning so we were still hopeful. Then by noon, the sky was dark and we were hearing thunder and seeing raindrops. It did clear back up but it was still overcast. We're scheduled to try it again next Monday. The forecast looks better for that day...now we just need a happy Reagan! And it's a good thing we canceled, because this afternoon she had another big, huge mucousy throw up (and then I drained her g-tube and yellow bile came out)! Poor girl. Something just isn't quite right (another 3 poops again today). Hopefully she'll be feeling better tomorrow! Reagan slept a little better last night...although she did wake up this morning with the crazy laughs again. It's been another crazy laughing day for our girl. She smiled all day and it wasn't until tonight that we got a few frowns with the laughs. She's had a weird last few days. She had 1 dirty diaper Friday, 3 Saturday, and 3 today! Something is definitely off with her GI system! Could be the antibiotics...although I don't ever remember her reacting that way to them before! Thankfully, none of it really seems to be bothering her. Tonight she went for a swim with Grandma and she seemed a lot more relaxed...kicking around in the water and smiling the whole time! She's such a sweetie! Hopefully she hangs in there and has a good day tomorrow because we're supposed to have a photoshoot at sunset (if the weather cooperates)! I can hardly wait to get some new professional pics of my girl! Keep it in your prayers that everything works out and we get some beautiful pics!! Reagan slept off and on last night. The crazy laughs were plaguing her and they've continued to plague us all day! Now don't get me wrong, we much prefer them over crying, but it can be exhausting nonetheless! The nonstop laughing/squealing/screaming is no different than crying in Ryan's eyes! So he's been constantly freaking out because of it...all day. Fun. 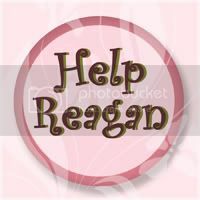 Thankfully Reagan seems to be doing well. Crazy...but good. Mike was wondering if maybe the crazy laughs have taken the place of the crying (as in, whatever it was causing her to cry like that, is now making her laugh). However you look at it, we'll take it! My girl is feeling better today! She slept well last night and woke this morning with smiles and fever free!! (Prayers answered!) Her PT came but Reagan started getting sleepy just as she got here and then proceeded to completely conk out! She stayed and stretched her really well and then Reagan woke back up literally seconds after she left! Playing possum, I think?!?! Then her OT came and worked with her and she managed to stay awake for that. She was awake the rest of the day, albeit a little flopsy mopsy at times (and still a little congested). We took a quick trip into town to have her glasses adjusted. They were sitting a little too close to her eye lashes and making red spots on the back of her ears (I guess she's grown a little since getting them). I wanted that fixed because I know it's uncomfortable enough to wear glasses, she didn't need them pinching her or pushing on her lashes giving her more of a reason not to open her eyes!! She seems to be doing well wearing them and definitely makes better eye contact with them on! Tonight Reagan had a case of the crazy laughs (and squeals/screams)! This was driving her brother crazy (and us a little too)! He doesn't understand and it makes him want to cry (like we need another reason for him to cry)!! Ryan has been a total handful lately. I don't know if he's teething or what but he's super cranky and not sleeping well...which is completely and totally exhausting to me! Hopefully he gets over this soon and becomes the easy baby that we so desperately need!! When Reagan started moving around this morning, I went in and immediately noticed her arm felt hot. Her nurse came in with the thermometer and checked her temp and it was 102 in one ear, 103 in the other! We uncovered her and I gave her a dose of tylenol. Her nurse checked her heart rate and respirations and both were up (160s and 40s). We gave her a bath to try to bring down her temp and she was so lethargic she didn't open her eyes but for a few seconds here and there. After the bath we put her back in bed and checked her temp again. It went down to 99, but then was back up to 102 only a short while later. We took her in to the pediatrician (all the while she was still OUT) and she said she has an ear infection in her left ear! 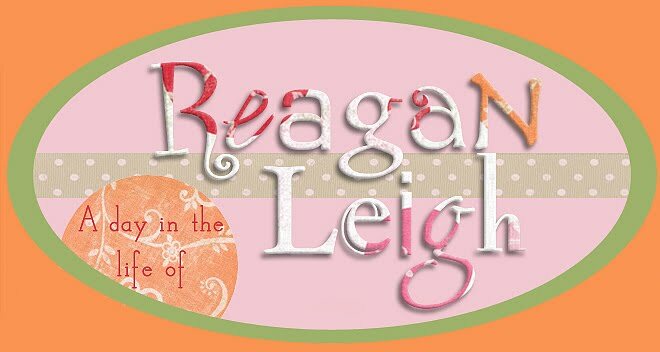 What's unusual is that Reagan doesn't usually run a fever from an ear infection! Her pediatrician also said that there is some virus going around right now that just has a high temp and no other real symptoms...so that's always a possibility too. But she does sound a little congested to me...not really in her chest, but her nose. She gave her some Suprax for the ear infection and hopefully that will help and she'll be feeling better by tomorrow! I'm just not sure why she's so lethargic! Is it because she feels so bad or is it because this is just a sleepy day (it's about the right time for one)?!?! I mean, normally if she had an ear infection, she would be super fussy! And today even when she kinda wakes up and looks around, she's still smiley!! Poor sweet girl! I honestly don't remember the last time Reagan was sick! She's been so healthy lately...and now that she's not having the full on bad days...we've really been smooth sailing (compared to before, anyway)!! So please keep it in your prayers that she starts feeling better soon and gets back to her sweet happy self!!! And to top it all off...her brother has been super high maintenance and fussy today...I'm seriously about to go crazy!! I just typed up a huge post and stupid blogger deleted the whole thing!!! I'm so mad! Reagan had a good day today. She slept well last night and woke up smiley! She was a little groggy in the morning and took a long 2hr nap, but then woke up happy and was alert the rest of the day. Tonight she was sounding a little gunky in the throat (like she needed to swallow something down), so I was a little worried she might get nauseous. I kept a close eye on her but she was getting sleepy, so we put her to bed. I heard her cough over the montior, so I ran into her room and she was throwing up! It was all down her neck and in her hair...poor girl!! She was still super sleepy though...she didn't even wake while we were changing her shirt! Please keep her in your prayers! Reagan slept well last night and woke up happy again this morning. She was in a much better mood today (and slept in til 10:15am). She was no longer on edge and she seemed more relaxed (even her heartrate was down from yesterday). She had a good day and did well for her therapies. Then tonight we went and had dinner at a friend's house (we rarely get out and do anything so this was a treat) and Reagan was as good as gold (I wish I could say the same for her brother)! So all in all, it's been a good day. I'm hoping and praying for more! Impossible to get a picture of this girl...she was moving, moving, moving! Reagan has had another good day today. She slept well last night and was awake and smiling (and laughing) this morning. She had lots of crazy laughs this morning and they have been intermittent all day. Her hands have been clammy and her back sweaty off and on, but other than that she's doing great. It's going to be a short post tonight because I have a cranky, hyperactive boy on my lap right now! Enjoy the pics! Ignore the goofy face...this was the best shot of her hair! Reagan slept surprisingly well last night. I think she was up a little, but not nearly what I expected. This morning she woke and all was good. She was a little tense and had some crazy laughs but overall she's been OK. Another fairly good day for my girl! Still no good pics of her hair! She's not holding her head up very well and I just can't seem to get a decent pic! It's pretty much the same as always, I had her keep it long but just trim it up a little. I was going for a month or two post haircut look. She's got a photoshoot coming up in the next week or two and I didn't want anything too short! Today Mike and I started on a juice fast. We were only going to do it for 2-3 days and we've been drinking veg/fruit smoothies all week, so we thought we were ready. I'm afraid Mike didn't make it. He got a HUGE migraine this afternoon and then was throwing up tonight. He's done. He nearly coughed up a lung! I'm still doing it. We watched Fat, Sick, and Nearly Dead and it was pretty motivating (and Reagan's feeding therapist has been juicing and telling me about it). I can't do a full on juice fast because I'm breastfeeding, but I've been drinking only juice with some protein powder added to it (I make all the "juice" in our vitamix blender). So anyway, that's been our excitement today! Reagan was up last night with the crazy laughs and she's had them off and on pretty much all day! She was a sweet girl all morning. She had PT, speech, & OT and was good for them all, a little groggy at times, but good. Then we took her to get her hair cut and it all fell apart. She was great, all was good, but when we got to the hair place there were a few steps we had to get up. I was at the top of the steps and her nurse was at the bottom. We were each going to pick up one end of the stroller and carry her up. Well needless to say, I picked up my end but her nurse didn't have the other end and Reagan flipped backwards in her stroller (whacking her head on the ground)! She started crying, I picked her up and (eventually) consoled her! Talk about a scene!! My poor girl...I felt SO bad!!! We did finally get her hair cut and it looks precious. The crazy laughs got even crazier as the day went on and we did have tears a couple of times. So we made it through the day and I'm hoping and praying she gets some sleep tonight and wakes up a little less on edge tomorrow!! Reagan got a decent amount of sleep last night but she was a little restless. She fell asleep around 11:30pm but then woke at 1:30am crying. Her night nurse picked her up and immediately she fell back to sleep, but the second she tried to lay her down, she woke back up again (not upset, just awake). Over and over. Eventually she was able to lay her down in the therapy room and she stayed asleep. She woke up this morning right around 8am...this time she woke happy! She's been a super good girl again today. Very smiley, very easy going. Which is good because we had yet another new nurse today. This morning Ryan had his 4 month baby check up. He's 98% percentile in height, weight, and head circumference!!! I told you he was HUGE! He's 19lbs 10oz, 27.5in long, and 18in head circumference. Big boy, big boy. Reagan had vision therapy/OT this morning, followed by PT. Then this afternoon we took her in to see her dentist. All looks good. He's happy with her teeth, no sign of cavities, gums look good, a little tartar on her back molars but that's common with tube fed kids and it's not enough to warrant cleaning just yet (we'll avoid anesthesia as long as we can)! Reagan was a trooper with him jamming that mirror in her mouth! I was afraid she might gag, but she was great! She really has been a good girl today! A few crazy laughs tonight, but overall she's still doing great! Thank you for your prayers for our girl! Reagan slept well last night and then woke this morning right around 8am. She was a little groggy off and on throughout the day, but overall she's been good. Not so much smiley this morning, but more so as the day has gone on! Thank God everyone behaved themselves because we didn't have a nurse today and I was living in fear of her being on edge and her brother setting her off! Hopefully we have someone here tomorrow! Ryan is supposed to go in for his 4 month follow up and Reagan has a dentist appt! Busy, busy! Here is the video I promised of Ryan...I have one more of him sitting that I will post tomorrow! Enjoy! Reagan slept well last night...and she continued sleeping this morning! Finally around 11am she started moving around, so Grandma went in and started talking to her. She woke up and immediately her occupational therapist showed up. She worked with her for a while and then she had a small break before her summer school teacher got here. He worked with her for about 40min and then she fell fast asleep. She was OUT! It's looking like this is her sleepy day. She's slept all afternoon! She did finally wake up around 8pm (and wasn't too happy)...she stayed awake til around 10 and then was back out again. What's strange is that she's still having these sleepy days (where she sleeps almost an entire day) but it's not like she's having bad days or not sleeping before them. We used to think that she had these sleepy days in order to recover from bad days or days of no sleep, but apparently not. I guess her body just needs them, no matter what. Not surprising for mitochondrial disease...just surprising for us, I guess. Although lately everything is a little out of whack for us (but in a good way). No bad days is a great thing. I don't know how long it will continue, but we're enjoying it while we can! Ryan, on the other hand, has been quite the handful! I think he's teething (lots of spit, biting on everything, red cheeks, very fussy & restless) and he's driving me nuts!! He is cute though! I have two really adorable videos I want to show everyone but for now they are not wanting to upload to blogger! I'll have to work on it! In my free time (right)...no nurse again tomorrow! Pray for a good day for everyone!! Reagan has had another great day today! She slept well and woke smiling...and has been smiling ever since. Big smiles! It's so nice to see her so happy! She was a little more tense today (just in her body) and her heartrate was in the 140's...but other than that, it's been 100% good (she even had 2 dirty diapers that didn't seem to bother her)! It would have been a good day to swim today, she didn't have any therapies and it was overcast, but it was really rainy and at times with lightening and thunder so we just couldn't risk it! She didn't seem to mind though...happy to do just about anything! Enjoying her time with Grandma! Praying for continued good days!!! Reagan has been a great girl today. I think she slept last night but she was awake when I got up, so who knows! She was a happy smiley girl, so this was one happy mommy!!! Reagan has been darling and precious all day today. Very alert, very responsive. Grandma was certainly pleased to see her doing so well. It was a bit stormy today, so no swimming but hopefully we'll get her in the pool sometime tomorrow. Still feeding her a couple of times a day, not a lot (about 1/3 of the container), but she seems to enjoy it! Loving these good days for my girl!!! I'm hoping for a good week for her this week! Sitting up tall in her Childrite chair! It was seriously impossible to get a good picture of these two...Reagan is fuzzy, Ryan looks like a deer in the headlights!! We're not sure how much Reagan slept last night. Mike got up around 3am and laid down with her because she was awake and moving around. She never fell asleep while he was in there. She was so quiet...when I got up this morning I didn't even realize she was awake until I went in and saw she was wide awake! She's been a sweet, smiley girl today. Her temperature regulation is still WAY off. Her hands and feet are cold and clammy one minute and then fine the next! Her back is also super sweaty and she's definitely got the "bad day smell" (and she also had some chorea tonight). A few months ago that would be a definite sign of impending bad days, but lately everything seems to be out of whack and we see this in the middle of her good streaks! As I'm sure you've noticed, we haven't really had any real bad days lately. It seems she's traded her 1-3 horrible screaming crying miserable bad days for a longer streak of "off" days. We're still not sure why, but we'll take it! She's looking pretty sleepy tonight, hopefully she gets some good sleep tonight and has several more true good days because Grandma is coming tomorrow! I think Reagan slept fairly well last night. I woke up around 4am and looked at the monitor and saw her big (glowing) eyes staring back at me, but she kept closing them so she was obviously still tired. When I woke up an hour or so later she was back asleep. Her brother is still cosleeping with us and he's such a restless sleeper lately, I feel like I'm awake more than I'm asleep! Reagan woke up this morning a little after 8 and was all smiles. You can tell that she definitely feels much better today. The smiles are there but the random fussing is gone! Hopefully that means we're in for a nice long stretch of good days now! The only thing I heard that was even close to a fuss today was when the nurse was stretching her feet (obviously still a little sore). I wonder if they hurt her a little last week during the casting?!?! What's crazy is that we took her in for her 3mo follow up blood draw (for the EPI-743) and she never even made a peep! She's such a pro with blood draws...thankfully this phlebotomist was good and got her on the first stick! Tonight Reagan's temperature regulation was all out of whack again. Her back was hot and sweaty but her hands and feet were cold and clammy! Her body doesn't know what it's doing! I'm just hoping the good days continue!! Reagan slept well last night and then she woke this morning with smiles!!! I was pretty shocked about that! It was all good until around 11:30am or so when out of no where she just started crying! She definitely seemed to be in pain. I waited to give her anything but it wasn't getting any better so I gave her a dose of Lortab. That made a huge difference. She settled down and then just took it easy for a while (although Daddy did set her off again when he came home for lunch). She was good the rest of the afternoon (except for crying again when Daddy came home)...but you can tell that she's not 100%. Something is still bothering her and she's still a little on edge (still doing the crazy laughs)...but hopefully she's pulling out of it and she's ready to have some GREAT days in the near future! Grandma is coming on Sunday so I'm sure she'll be happy about that! Come on good days!!! Reagan has had another rough day today. She slept OK last night...woke at 5:30am with the crazy laughs and then had them pretty much had them all morning. She started fussing right before her speech therapist got here and then had some serious constipation issues (which explains why she was hurting). It took her a while to get over it, but eventually she was OK again. She had one more meltdown this afternoon, but again, she got over it and was OK. She's definitely not feeling well. If I had to guess, GI related. She's been having some issues with spit and swallowing a lot...we're wondering if her reflux is flaring up. Tonight she had a huge throw up and has seemed nauseous ever since. Hopefully she's able to fall asleep because that's the only thing that makes the nausea go away! Please keep my girl in your prayers...she's had a not so happy July 4th! Reagan kept sleeping last night after the Lortab. She slept from about 6:20pm-12:30am when she woke crying. Mike laid down in bed with her and was able to get her back to sleep and she slept through til 7:30am this morning. She woke OK...no fussing, but no smiles either. She was definitely still on edge but she was OK. Today we were supposed to have a new nurse starting, well of course 8am rolls around and no nurse. I call the agency, they call the nurse and she doesn't answer. No one wants to take the blame. Supposedly they confirmed with her that she was working today, but according to her (when they finally got a hold of her 3 hrs later), they had told her that she wasn't working!!! Ugh. I am SO sick of our nursing agency!!! I know they all have the same issues, but are they ALL really this bad?!?!? I find that hard to believe! Anyway, Reagan's OT came at 10:30am to work with her. She knew Reagan was on edge so she was taking it easy and then POW 30 min into it...she was crying full throttle! I gave her a dose of Lortab, but she cried steady for 20min or so until it kicked in. Poor thing, she's definitely fighting those bad days! Her therapist swaddled her up in her bean bag chair and she dozed off. She and her brother both slept two hours or so and when she woke up she was wide-eyed but not crying. She was awake about an hour and then she fell back to sleep and slept all afternoon! She must have needed it and/or God must have known I couldn't handle her brother and her screaming all afternoon! However you look at it, we made it through the day nurseless and without any major incidents (thank you Lord)! Tonight we have a night nurse so that's good. No plans for tomorrow. Reagan enjoyed the fireworks last year but I'm guessing she's not going to be up for it tomorrow. Oh well. I don't think Ryan would like the loud noises anyway. We were definitely nervous about last night, but other than waking up once crying (and settling back down fairly quickly), Reagan actually slept pretty well. And she continued sleeping until 10:45am this morning! Again, I was nervous about how she was going to wake up (because she was fussing here and there in her sleep), but she woke OK. A little wide-eyed and serious, but OK. She was super sweaty and smelled very much of bad days, but she was alright. She had speech therapy and even ate some food and all was good. She was a little on edge (and didn't like us talking) but managed to stay calm all day. It wasn't until tonight that she finally flipped out. She was crying, Ryan started crying...we had a big mess! I gave her a dose of Lortab and thankfully it helped her to settle down and fall asleep. As of now, she's still asleep! Hopefully she's able to sleep well tonight and wake up tomorrow feeling better! It's been a weird day today. Reagan slept well last night. She woke up crying once, but Mike got her to settle down and then I never heard another peep out of her. This morning she woke up a little on edge...still smiling, but a little more serious (with very cold clammy hands). She has a red bite on her nose...I have no clue where it came from. I noticed it yesterday morning and thought it was a scratch, but today it's bigger and there's an actual bump. She was on edge all morning and kept making fussing sounds here and there...but it wasn't until this afternoon that things escalated (she was having a lot of gas and then a dirty diaper...we think tummy pains are to blame). She and her brother kept feeding off each other and eventually we had to part ways and keep them in separate rooms. Reagan did meltdown and start crying, but she calmed down fairly quickly and then was just back on edge again...lots of fussing. Not sure what's going on. Are we in for another week of her being on edge or is she going to have full on bad days again...who knows?? Whatever it is, I hope she gets over it quickly and starts feeling better again soon! Please keep our girl in your prayers! !